She was born on Aug. 29, 1886 in Big Grove Twp., Benton Co., Ia. to parents Henry Harrison Thrasher and Ella Baker. She attended Tilford Academy, Vinton, Ia. The 1915 Iowa Census indicated she completed 12 grades plus one year of College. This may have been advanced training at Tilford Academy, however, this was not considered a College. After graduation she worked for three years as a telephone operator for Farmers Telephone Co. She was a talented musician and played the piano. She lived her entire life in Benton Co., except for a short period of time in Jones Co. with her parents. She died April 16, 1958 in Waterloo, Blackhawk, Ia. Catherine (Lavonne) was born on March 5, 1912 in Big Grove Township, Benton Co., Iowa to parents Lewis Carlton Dake and Maude Ann Thrasher Dake. She attended a country school in Big Grove Twp, Benton Co., Ia. and High School in Vinton, Ia. She attended Iowa State Teachers College and taught school for one year after graduation. On Dec. 30, 1933 she married Orval McVey. He ran McVey Feed Store, a grinding mill and feed store, in Vinton, Ia. for 43 years, until he retired. (Orval died on March 3, 1984). They originally lived on acreage near Vinton, Iowa. After her Grandmother Thrasher died, she and her husband moved in with her Grandfather, for about 5 years, to help take care of him. They later lived in Vinton, Benton Co., Iowa in the same home her grandparents and parents previously owned. LaVonne was an active member of Wesley United Methodist Church, the Legion Auxiliary and Royal Neighbors. She enjoyed crafts, painting, raising houseplants, sewing, traveling and reading. Her death, from complications of a broken hip, came peacefully on November 29, 2004 at the Vinton Lutheran Home at the age of 92 years. They had children named: Beverly (Hodges) of Vinton, IA, Janice (Sarchett) of Vinton IA, and Barbara (Anderson) of Orlando, FL. Funeral services were at the Wesley United Methodist Church in Vinton, IA and interment at Evergreen Cemetery, Vinton, IA. 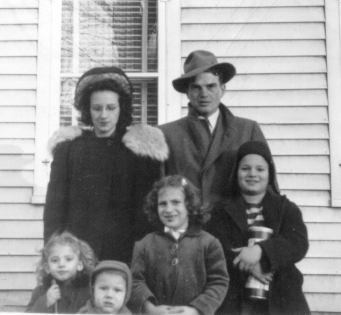 Thelma was born on Nov. 2, 1913 in Big Grove Township, Benton Co., Iowa to parents Lewis Carlton Dake and Maude Ann Thrasher Dake. She married George R. Reed. 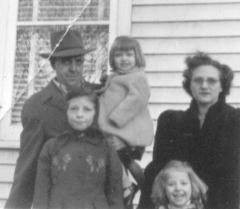 George committed suicide on the family farm Sept.13, 1953. They had children named: Donald, Karen, Monica and Richard Reed.